Hey there heroes! 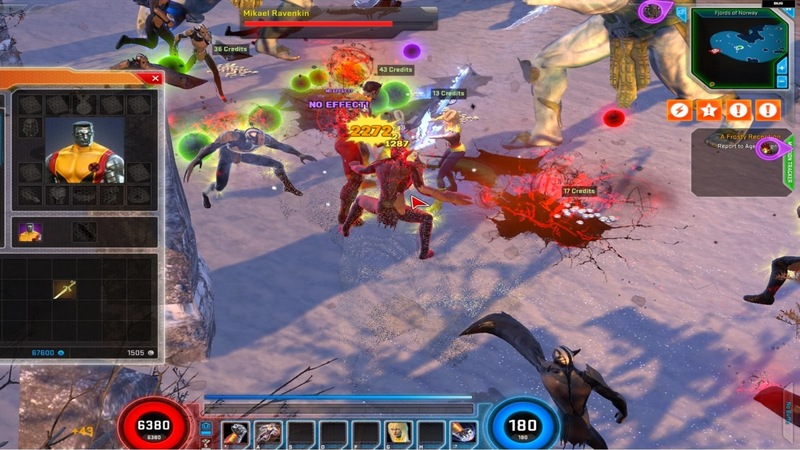 I'm back with LOADS of Marvel Heroes info, so do read on. Before I begin though- all you MH addicts can join the group for our Comic Book Nerds Are Hot MH guild & jump in our discussions here. Special thanks to Rebecca Miller & Oz for helping me with this post. -Halloween costume sale is on where one costume for each hero has been put up in the in-game store at 20% off. ^All the costumes in the 2nd pic are currently on sale. Brood Wolverine & Frankencastle Punisher are on sale until Nov 8. -Various changes to the Legendary Quests. Spawn rates of required enemies have been raised for various LQs. Additional Maggia have been added to Midtown Patrol. LQs now properly drop credits. -ENHANCED Headpool pet & Captain America's Nomad costume are both available in the in-game store for Halloween until November 15. 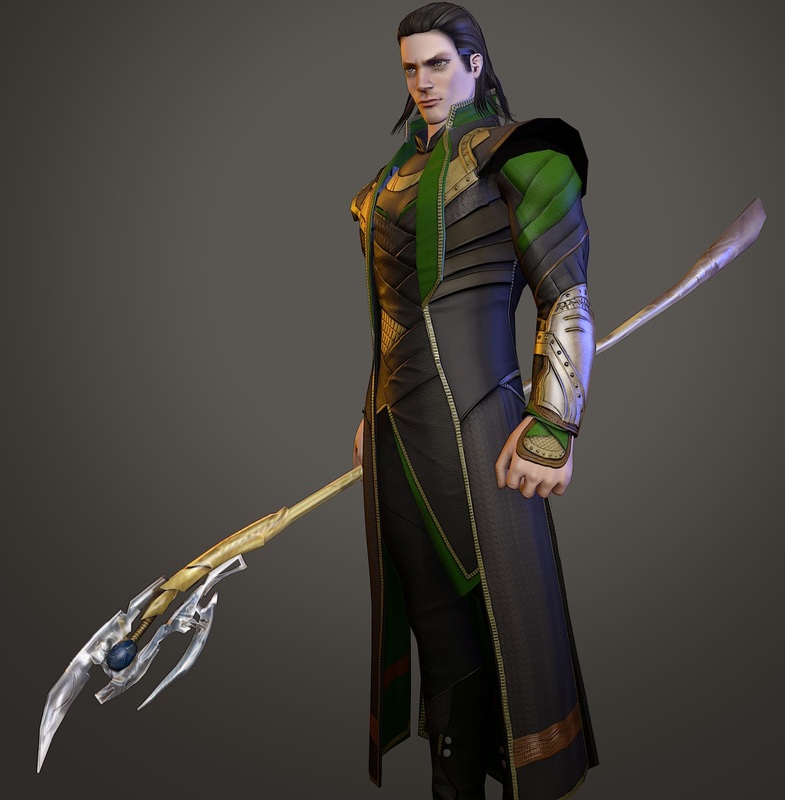 -Loki will be the first playable reformed villain in MH with the Asgard patch 2.0! You can buy his presale hero pack at 10% off here. 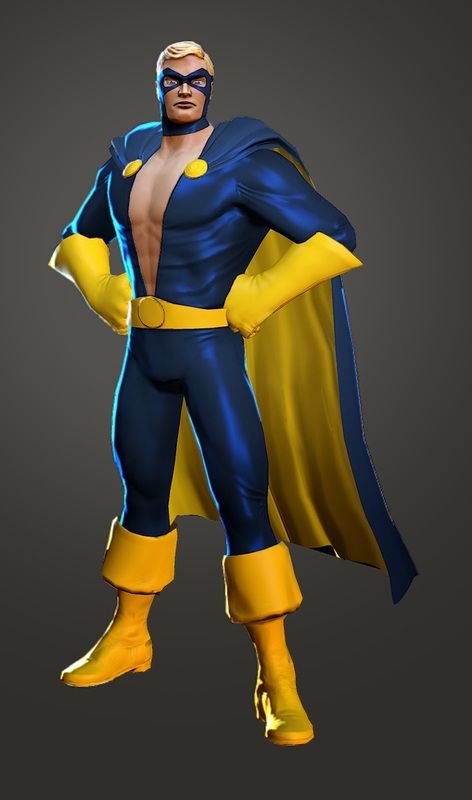 *His movie traveling costume will be his default with his classic costume as his alt. *His first skill tree will focus on his illusion powers. Illusions can only be maintained for a short time - continuously creating them is the key against powerful enemies. These illusions are projections of Loki & will react to commands he performs, synchronizing their attacks to hide who the true Loki is. 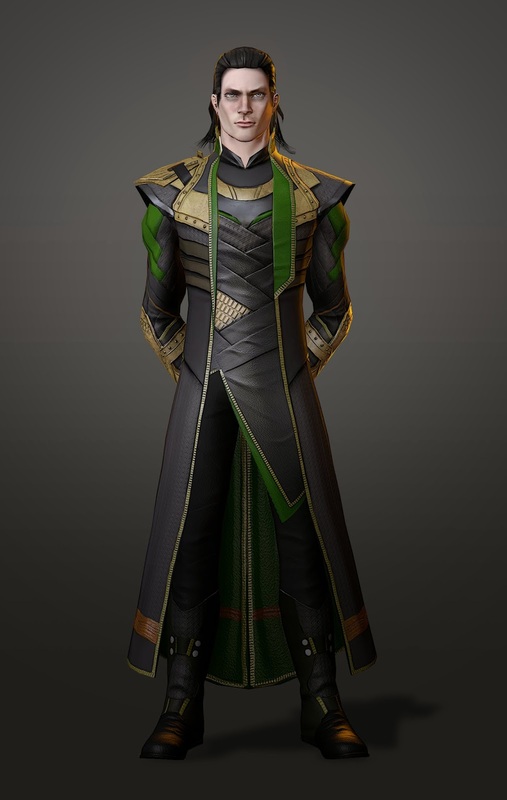 Illusions are expendable & can be detonated with great force when Loki no longer needs them. 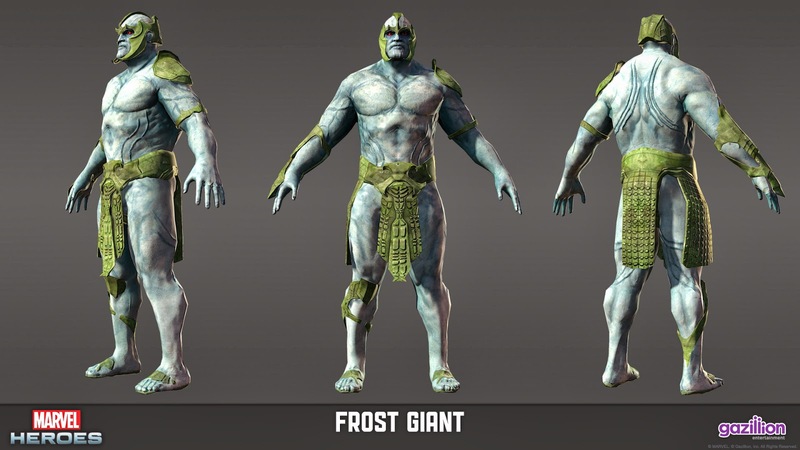 *Being part Frost Giant, sorcery & frost magic will be part of his second skill tree. He'll channel ice & frost to hinder enemies. His mastery of magic lets him manipulate enemies, hindering their ability to fight, or even turning them against one another. *Loki's third tree will allow him to be a sort of melee character. He'll even transform into a Frost Giant as his signature ability. -Rogue & Magik have been confirmed. -Next 5 heroes in the game will be: Gambit, Nightcrawler, Ghost Rider, Moon Knight & Doctor Strange. Gambit will be released in the third week of November. -Ghost Rider will move on foot & make use of his chains, mace & a hellfire shotgun. He'll also use his motorcycle for quite a few skills. *With one skill, Ghost Rider can rev up his motorcycle & let it fly off, crushing any enemies in its path. *Penance Stare will be his signature ability and will serve as a high damage single target DPS attack. *For his Ultimate ability, there are two options Gaz is considering: 1) Ghost Rider gets on his motorcycle & drives around the screen, destroying everything & leaving hellfire in his path. 2) He summons a hellfire version of his motorcycle & mind controls it while he fights. -Both skills will be in Ghost Rider’s kit- they just need to decide which one to juice up for his Ultimate. -X-23 will make her entrance in the second half of 2014. Her animation & modeling is done, but she doesn't have a design pass or VFX yet. -Gambit will be for 600 splinters, Nightcrawler (& almost all others) for 400 & some simple ones in the future (X-23, Beast) will be for 200. -Among the reformed villains joining in as playable heroes- Venom & Juggernaut are confirmed, Elektra is being considered but not yet confirmed. -Silver Surfer may appear in the game by May or June 2014. He will be on his board for most moves. -When War Machine gets added in the game, he won't be an enhanced costume for Iron Man but a separate hero. -Scarlet Witch review in last week of November. -Cyclops rework is also happening. He won't have any summons. -Sidekick slot being considered. "Like sidekick Jarvis, Aunt May, maybe some heroes with just a few powers like Kitty." Bob Agent of Hydra is also being considered as a sidekick. -Colossus will have Magik (<) & Kitty as summons after his rework. They promise he'll be faster & stronger. -Captain America will have no summon but they said he won't need them when done. -Punisher will have a Van move & it will either be his Signature or Ultimate Power. 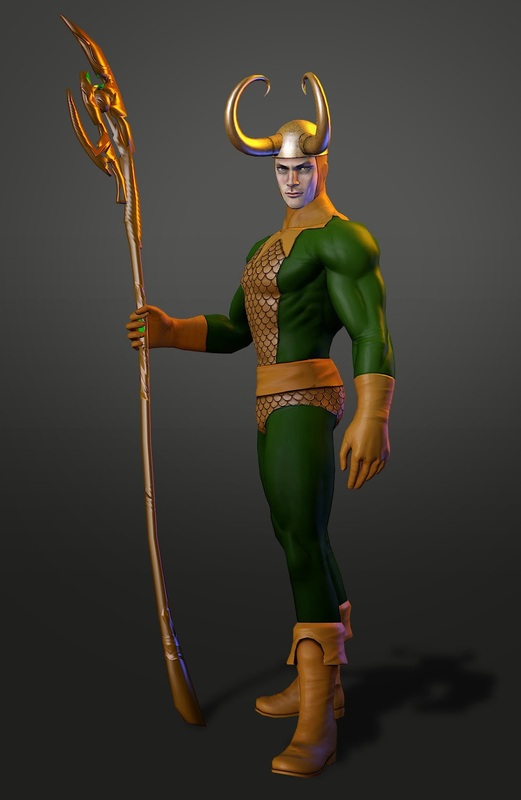 -You'll be able to cast power cosmic by around May 2014. -Storm will eventually hover like Human Torch currently does. -Dual spec system will be added in. -There are no plans to have pets pick up stuff at this time. Not 100% sure, but unlikely. -Don't expect a Darkwing Duck pet. -Pizza Dog is on the list as a pet. -An Age of Apocalypse costume is coming soon. Not revealed for which hero. 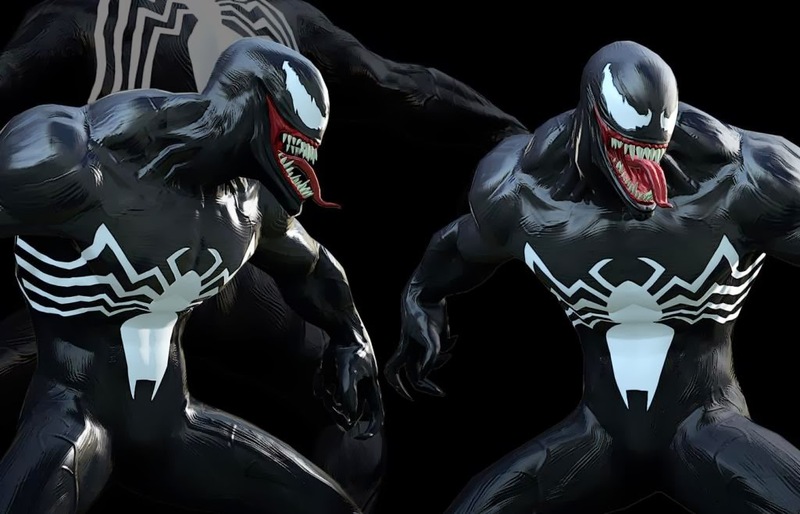 -Carnage will be a costume for Venom when he becomes available. -Launching to coincide with Thor: The Dark World movie release. -This week's Patch 2.0 will be the first Asgard patch with Chapter 9 (followed by Chapters 10, 11 & 12 in December, January & February respectively). -First patch will have an investigation of a mysterious situation in Norway, involving a game-wide event that supports SHIELD & the Fantastic Four's investigation of the situation (while stopping HYDRA from trying to do the same thing). 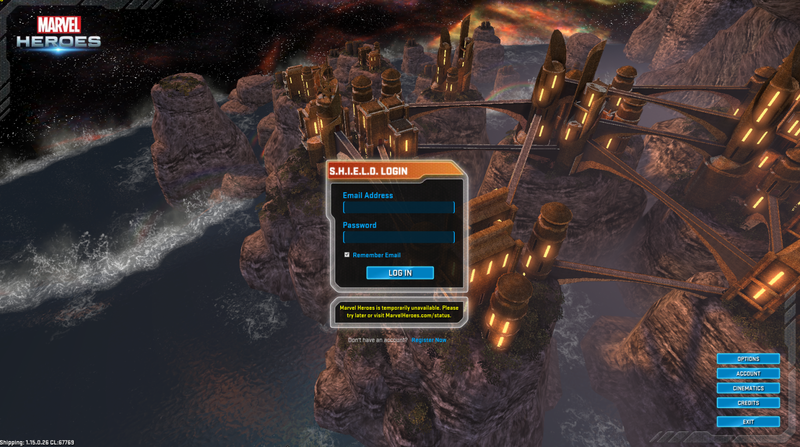 This event should take approximately 2 weeks to complete & will open up access to Odin’s Palace as a new player hub. 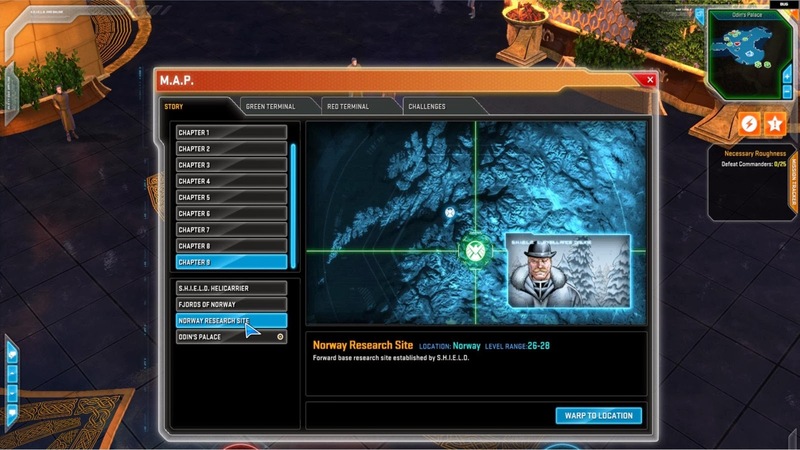 -Norway is overrun with Frost Giants & Dark Elves & players need to help Reed Richards by gathering components for his research by defeating these creatures & tackling various other surprises. 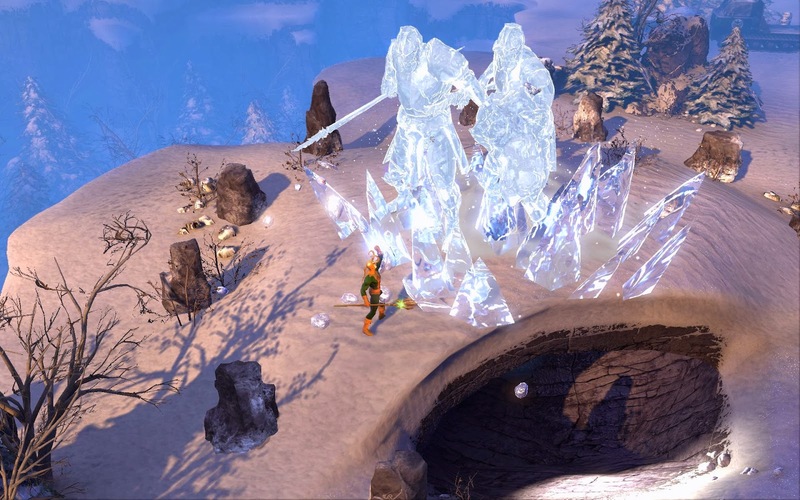 -This event unlocks the Bifrost Bridge, which will grant players entry into Asgard, but before the story can continue, players will need to fight their way across the Bifrost Bridge & then clear out Asgard itself of the invading evil doers. -Expect new motion comics for the Asgard content. -The Fire & Ice PVP map will be located on the eastern side of Asgard on a island controlled by two warring Giant factions. -It will pit players against each other in a 5 vs. 5 arrangement, rewarding players with XP, loot & new Asgardian Crowns of Valor. -This PVP mode is currently on the test center. -Once it goes live, it will be in live beta for approximately one month before they start leaderboards, but all PVP rewards will be awarded at 100% value. -New items will abound in the 4 chapters of Asgard, with 100+ new uniques (including the 10 player-designed uniques), 7 new relics (>) with a costly relic unbinding recipe in November, Legendary Items, StarkTech items, PVP rings, new medallions for the half-dozen new supervillians & new artifacts. These will roll out in the first patch & continue with each subsequent Asgard patch. -The Professor X Team Insignia is completely built but there are animation problems with Xavier's wheelchair. This insignia will provide a team aura & grants teammates a chance to summon Professor X (who will toss out massive psionic attacks) whenever they deal damage. -3 more Captain America uniques in the pipeline. Aunt May's Cane unique is in next patch. -Loki will be in chapter 2 of Asgard, he drops a specific unique & artifact when you defeat him. -New Fortune Cards (Mark 2 & 3) will not drop in game, except maybe for Christmas. -Legendary items (>): have their own slot & a fully-leveled one unlocks 5 benefits. Every unlock takes about 2-3 levels of XP & they gain XP even when your hero is at L60. Legendaries will cost 500 300 Odin Marks from Asgard. -The current selection of five free starter heroes will increase to ten. -Splinter hero sales are never going to happen. -Cosmic Doop coming soon. Doop fights back but drops a cosmic. -Loads of UI elements are currently being worked on: gifting tech to buy stuff for others, crafting, waypoints (>), etc. -Intelligence will be reworked to remove XP penalty/bonus & affect crit & spirit instead. -You can max out Fighting, Strength, etc. very easily, so the cap will be increased by 2. -They are looking at several attributes to be more useful at lower amounts & higher amounts & they are adding SHIFT X & BEYOND levels in Asgard to attributes. Phew! That was a HUGE read, eh? 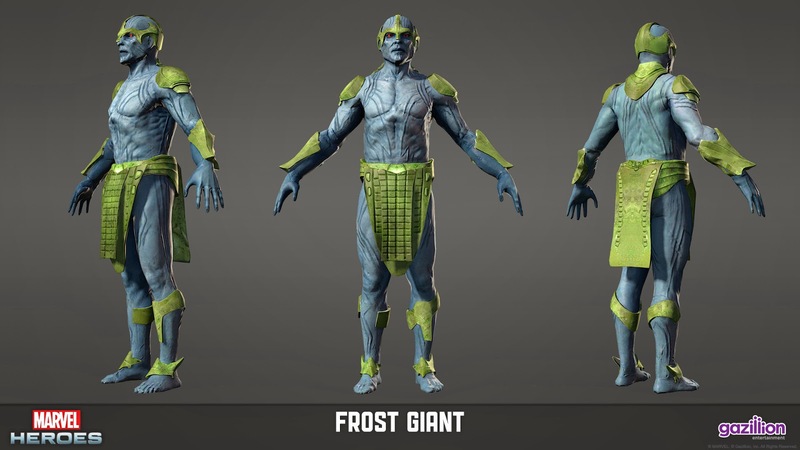 So how pumped are you guys for all the new stuff that's gonna come into Marvel Heroes?? Post your views in the comments. Until next time, happy gaming & keep things heroic! The Thor updates are exciting! 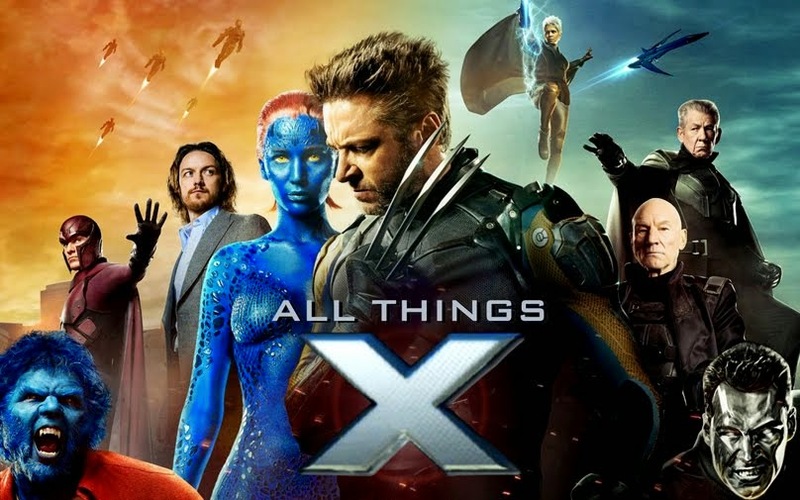 Have you seen the Xmen trailer? I can't wait for the Asgard updates! Gonna be live by Friday at 6 am PST. Of course I've seen the DOFP trailer! AND loved it! (Though the trailer music was underwhelming for me sadly). I've been meaning to do a DOFP post. I don't know when but I will. :P Going to see Thor 2 now! Review coming soon after.